Do you have difficulty hearing in noisy areas? Is it harder to hear men’s voices than women's voices? Or, do voices sound mumbled or slurred to you? These are just a few of the common symptoms associated with hearing loss, which is much more common than you may think. According to the National Institute of Deafness and Other Communication Disorders, approximately one in three people in the U.S. between the ages of 65 and 74 has hearing loss, and nearly half of those older than 75 have difficulty hearing. Hearing loss can be very frustrating, and isolating, when you feel like you can’t participate fully in life and are unable to hear what's going on. Adding to the stress is the fact that Medicare does not cover hearing aids, and health insurance typically does not either. Under Medicare, hearing tests are generally covered with a physician's referral. And in some states, Medicaid provides coverage for hearing aids. In lieu of the overall lack of hearing benefits available, the cost of a hearing aid can be a lot for many older Americans to take on. According to research from The Hearing Review, obtaining hearing aids from a licensed hearing aid dispenser can cost upwards of $1,000 for two basic devices (in a bundled-service model) with costs rising in excess of $6,000 for the inclusion of more advanced features. Meanwhile, the potential hearing-impaired population in America is growing larger every year. By 2029, the U.S. Census Bureau estimates that more than 20 percent of the total population will be 65 years of age or over. If you need one but you're putting it off because of the costs, there are several ways to save money on hearing aids. Here are some tips to help you be a smart and sound hearing aid buyer. First, do your research: Hearing aids are a big investment and their lifespans are not infinite. So, start by doing your homework and looking for a reputable and certified audiologist—credentialed medical professionals that are trained in evaluating hearing and fitting hearing aids. You can search for one in your area through the American Speech-Language-Hearing Association. Also, make sure you understand all the terms and conditions of any contracts and what is and is not included, such as extra visits or a money-back guarantee if you are not satisfied with your hearing aid device. Benefits for veterans: The U.S. Department of Veterans Affairs provides a hearing aid benefit for veterans if the hearing loss was connected to military service or linked to a medical condition treated at a VA hospital. Also, if your hearing loss is severe enough to interfere with daily activities, you can get a hearing aid. To learn more about this benefit for veterans, go here or call 1-877-222-8387. Try a discount health plan: Some non-insurance discount health plans can help you save money on hearing aids and evaluations, in addition to supplementary services like dental care and vision. If you're not familiar with discount health plans, these membership programs work like being a member at Costco or Sam’s Club. You get a discount when you visit in-network providers or a discount on select name-brand hearing aids (depending on what your plan includes). You can find various discount health plan options through a variety of associations, organizations and companies, such as Careington, :DentalPlans, Coverdell and New Benefits. For Medicaid recipients: As previously mentioned in this article, Medicaid does provide some coverage for hearing services in certain states. For example, Florida's Medicaid program covers the following: hearing aids; hearing evaluations to determine hearing aid candidacy; hearing aid fitting and dispensing; and hearing aid repairs and accessories. To see if and what your state covers, visit the Hearing Loss Association of America online. Your tax deductions: As always, health care costs that exceed 7.5 percent of your adjusted gross income can be deducted from your federal income taxes if you itemize. To reach this percentage, consider purchasing a hearing aid and opting for any elective surgery procedures or other health and wellness appointments in the same year. On your medical expenses, you can include the cost of a hearing aid and batteries, repairs, and maintenance needed to operate it. To find out what other medical and dental expenses can be itemized on your taxes, view the IRS Publication 502. 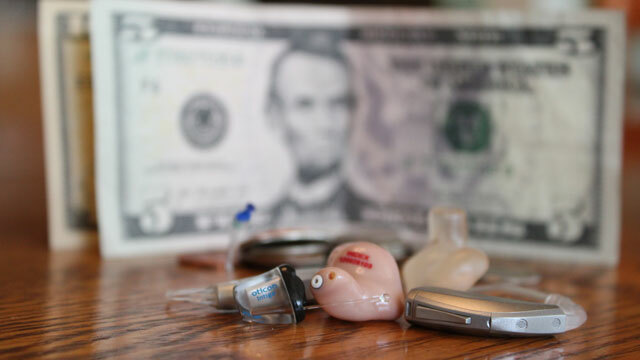 Do you have any tips that can help people save money on hearing aids? Please share those tips with us in the comments below.